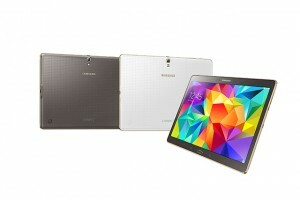 Samsung didn’t slow down its rhythm and has just introduced a new series of tablets. The Tab S are the first of the Galaxy series and bring the features of high-end smartphones to tablets. After weeks of rumors and leaks, finally yesterday the two members of this series were officially presented. The new Samsung tablets have 8.4 and 10.5 inches respectively, and its main feature is the Super AMOLED screen, with a resolution of 2560 x 1600 pixels. With this resolution, Samsung devices are highest resolution on the market. This type of display provides brighter colors than LCD, but involves a significant increase in price. The Galaxy Tab S will consume less energy than their respective versions with LCD screens, thanks in part to the fact that they don’t need backlight for the screen and in part by the Power Saving Mode that include. This allows the Galaxy Tab 8.4 to have a 4900 mAh battery and weight 294 grams, while the 10.4-inch tablet is able to include a 7900 mAh battery, although its weight increases to 465 grams. Both models are incredibly slim, with a thickness not exceeding the 6.6 mm. Both tablets carry an eight-core processor Exynos 5420 with Mali-T628 graphics or a Qualcomm Snapdragon 800 quad-core 2.3 GHz, variable depending on the region. They have an 8 MP rear camera and a front 2.1 MP one, 3 GB of RAM and 16 or 32GB of internal memory, expandable via microSD card up to 128 GB. They will come with Android 4.4.2 personalized with Mazagine UX, which the company has already included with the Galaxy Note PRO and Galaxy TabPRO earlier this year. 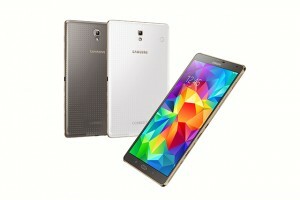 How it is usual, Samsung includes a lot of software to make the devices more attractive. Specifically, the Galaxy Tab S will have a new service called Papergarden to view digital magazines, debuting in these tablets. In addition, the company also offers promotions such as free access to Marvel Comics for 3 months, or a free monthly Kindle book, among others. Finally, depending on the country where we are, we can enjoy Netflix. 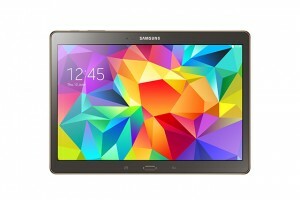 Samsung will offer a collection of accessories designed specifically for the Galaxy Tab S, such as a case with three viewing angles, a simple protective case or even a Bluetooth keyboard designed specifically to fit the Galaxy Tab S.
The price is not known, but they will be available in black and bronze starting the next July. They will be available with several configurable options, with or without LTE, and with 16 or 32 GB of RAM.